I’ve decided to take the route of collecting all my Dave-leaving sadness and cramming it way down into my reality masking, humor generator. Not only can I avoid any possible un-manly emotional outbursts, but in doing so, I will create MORE content for holyjuan.com. I do this for myself, but you, my faithful readers, will reap the reward. 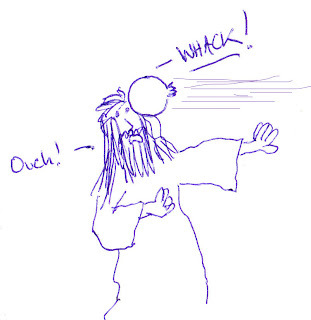 And now enough of my personal issues and back to comics of Jesus getting hit with a water balloon. Answers to "Can you find seven things wrong"
Can you find seven things wrong with this photo? HolyJuan.com is not being sold!